Taken isn't your run-of-the-mill action movie. Well, of course, there are similarities with the typical spy-action thrillers like the Bourne franchise. For one thing, it's set in Europe. Somehow, the best spy chases are always set in Europe. And then there's fight scenes, car chases, and more fight scenes. 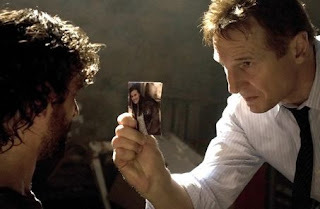 What makes Taken different from the rest of them is Liam Neeson. Yes, he is actually director Pierre Morel's secret weapon, as the fight scenes in this movie are actually more realistic because of Mr. Neeson. Let me put it this way: the fight scenes in this film are more...brutal. You have Liam just giving one of the villains a chop in the windpipe, another a twist on the neck. In short, his fighting arsenal is composed of the same moves a retired spy actually has. And only a personal search for a kidnapped daughter will actually draw a spy out of retirement. Liam Neeson gives a really great physical performance, and for those of you who thought he was growing old, you thought wrong. Mr. Neeson is as fit as a Jedi master. Famke Janssen, on the other hand, does nothing more than grace the screen with her pretty face. And she is noticeably older than we remember her from her Jean Grey days. From a simple plot to complicated action sequences, master storyteller Luc Besson does it again (the screenplay was co-written with Robert Mark Kamen). Taken is sure to keep Besson fans entertained, as well as eagerly anticipating what movie he has next up his sleeve. hooray for liam neeson! he has a new film! :D rob roy is my favorite liam neeson film, but then again i haven't seen a lot of his films... XP he's cool as qui-gon jinn, but i think alec guinness did a better job as jedi master. :D hehe. luc besson doesn't really direct much nowadays. he just writes stories and produces them. his last production was Transporter 3 i think. haha i'll come up with a Star Wars special just for you. i know very few girls who actually like Star Wars. a star wars special huh? how about video clips of the ewoks speaking tagalog? :D we're not sure if that was just an accident on our copies of return of the jedi, but you might want to check it out. i think that was the scene where they first saw c3p0. ^^ hehe. i know what you're talking about. i think it's "ngayon, puno daw 'to. mukhang tanga." U2. No Line on the Horizon. Coldplay's "Life in Technicolor ii"